I has been a while since I posted and a lot has been going on. Problems with Arthritis in my neck caused awful headaches every day thankfully it has settled down again. Various other problems seemed to arrive one after the other that took up my attention and meant knitting took a back seat for a while. However I am back and decided it was time to make myself something. 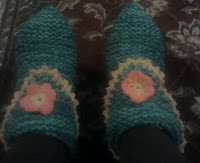 On Sparkpeople we have a September Stash Buster Challenge and I decided to make some slippers. Now I have never made them before and hunted a round for a really easy pattern to follow and found one. These are so easy to make that I made them really quickly. 2 strands of DK yarn held together as one ( DK yarn is 8ply yarn in the US) I chose two different colours of green that I thought would look good together. A small amount of bright yellow and orange for the embellishments. 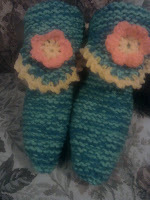 Here they are not bad and adding the picot crocheted edging around the cuff added a nice finishing touch to them. I also made my own crocheted flowers I had no pattern to follow to made it up. I will try and write down what I did. I think that is what I did I just played around until it looked right to me and I was happy with the result. Sew in thread ends and hey presto a flower is born. 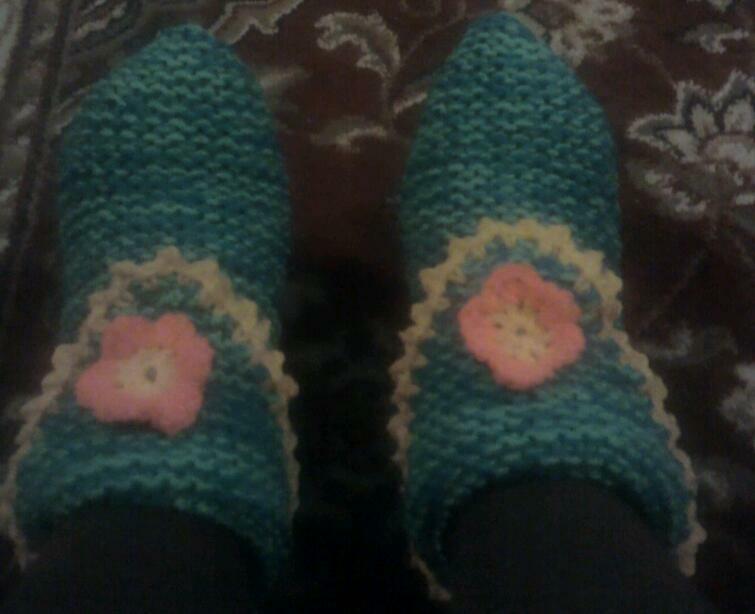 The slippers are nice and cosy just right for the colder evenings ahead of us and perfect for when I want to relax and knit when all the washing up is done and I can just chill out. Later on I will make another pair so I have on a change of colour and can wash the others. These are fun to make and so easy a beginner could make them. I want to make one for the Neonatal Unit along with an Angel Pocket I want make a few up and then give them to the unit.